Portable washing machines are lightweight laundering options- particularly for apartment dwellers who are fed up with hauling their laundry to a filthy basement or a half mile away to the local washateria. They do take some trial-and-error testing before getting up and running the way you want them. Particularly, you'll have to get a feel for how much laundry you can load into the washing machines without overtaxing the agitator that spins the clothes clean. (We should note, the EasyGo is a little bit different- it is actually a hand-powered washer.) As well- too much water and you can cause it to leak. That said, it took most users about a week or two before they had their portable washing machines up and running the way they wanted it. One of our top picks is the Panda XPB36- this 28 pounds, 22.8 x 14.2 x 25.6 inch compact washing machine is described by its manufacturers as suitable for condo and apartment living, and comes with a spin dryer as well as a drainage pump so that you can easily drain the water into a bathtub or sink. The washing side is split half-and-half from the dry spinning side. It has a 7 to 9 pound washing capacity and the spin dryer has a 3.5 pound capacity- which means that for every one load of wash you do, you'll likely have to do 2 loads of spin drying. Its reviewers say that it has a very small footprint, is incredibly light, as well as disarmingly effective at cleaning clothes. Some reviewers say that the lint trap isn't terribly effective, and others wish that it came with a buzzer so that you would know when the wash or spin cycle is done, but these are relatively minor quibbles. As we previously mentioned, you will have to do a couple loads of wash before you get the hang of how to effectively use this portable washing machine. One reviewer had the handy bit of advice to put clothing that has long sleeves or legs into a mesh bag so that they don't get caught up in the agitator. Another reviewer says that the dryer can get a little bit noisy when in use so they have taken to sitting whole unit on some folded towel so that the wobbling and great too much noise. In all, this is a relatively inexpensive portable washing machine that many apartment and condominium dwellers prefer to the annoyance of their local washateria or basement laundromat. Let's take a look at five of the best-selling portable washing machines on the market today and see how they compare. The mini washing machine offered by Giantex is portable, efficient and useful for people that are tired of hand washing. Users love that this portable washing machine is perfect for small apartments and that it is convenient and easy to use. However, most of the customers note that the inlet hose is too small. With a washing capacity of 11 lbs and a spinner dryer capacity of 6.6 lbs, this compact washer and dryer has a size of 24.8″ x 14″ x 28.35″, a 300 W washing power, a spinner power of 110 W, and a maximum water temperature of 54 C. Overall, it seems like a very good choice if you are looking for something small, but well-built. Users express very positive opinions regarding the Giantex twin tub washing machine, praising its performance, durability, and effectiveness. One user shares that this mini washer manages to remove even the toughest stains, and although it’s small, it is remarkably powerful and works quietly. Another buyer commented that she was extremely surprised how quickly this compact washer did the job. She was ready with one laundry load in 12 minutes and for her, it’s perfect for dorms and guest houses. This customer also advises that you shouldn’t spin dry the clothes for long since it takes about 20 seconds to do the job. However, most customers have complained that since the hose doesn’t fit their faucet, they have to fill the small clothes washer manually with water and that the drain hose is gravity based. They advise that you shouldn’t fill the washing machine up to the high line, and you should use only a small amount of soup to avoid suds. If you are tired of doing your laundry manually, you might want to consider the Panda small washing machine combined with a spin dryer. Users love that they can have their laundry ready in minutes with minimum efforts and that the spin leaves the clothes only slightly damp. However, some do note they have problems with the lint filter. 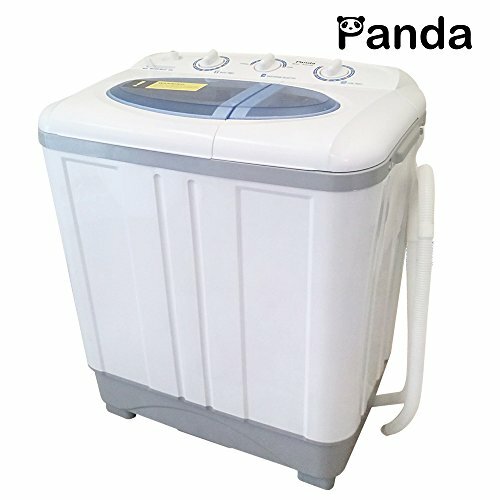 This Panda mini washer has a load capacity of 7.9 lbs, a spinner capacity of 3.5 lbs, a washing power of 240 W, a spinner power of 120 W and it weighs only 28 lbs. As a whole, it seems like an efficient tool for washing and drying clothes. Generally, users share positive experiences regarding the Panda small compact washer saying that it makes their lives easier. One buyer comments that she could wash anything she wishes by filling the washing machine with the shower head, and it comes out clean and almost dry. Another purchaser states that the small mini washer is very powerful, and you don’t need to run a full program for every wash. She is happy that she can do her laundry whenever she wants, and for her, it’s a necessity for anyone living in an apartment. Another user says that the small washer/dryer doesn’t take much room, and the spinner does remove most of the excess water. However, some customers have complained that it leaves their clothes in wrinkles and that they have encountered difficulties draining all the water from the machine. The Stark Electric small and compact washer machine seems like a good choice if you are looking for an effective, but a low-cost washer. Users love that the mini portable washer is easy to operate and perfect for washing their everyday clothes. But some do note that they have problems with the motor overheating after 30 minutes of use. 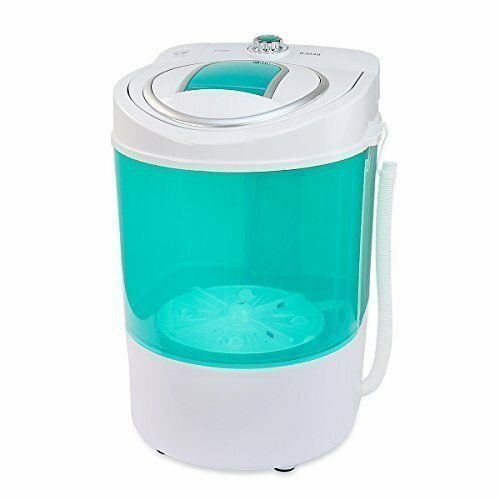 With a load capacity of 9 lbs, this small washing machine has a size of 23.6 x 15.8 x 15.3 inches, two water levels (12 and 9 Gallons), a timer, and it weighs only 9 lbs. Overall, it seems useful for washing small laundry loads, but cheaply made. One user shares that the small portable machine works very well, it’s easy to operate it, and it’s perfect for T-shirts, pants, socks, underwear, etc. Another buyer states that you can fill the compact washer machine with a decent laundry load and achieve a good washing quality. But she warns that you would have to do some wringing yourself before drying them. A pleased customer commented that even though it was difficult getting used to filling the small washing machine manual, it performs well over his expectations. However, some customers have complained that it can’t handle too many clothes, and they are disappointed with the lack of spinning feature. The EasyGo hand powered washer is stylish, well-designed and a good choice if you want to save electricity and water. 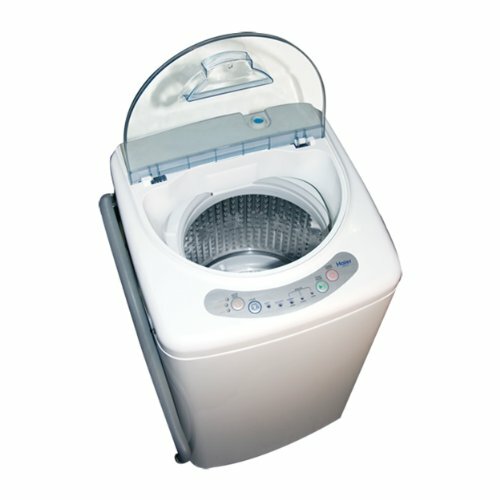 Users love that this mini washing machine is easy to operate and that it works great on delicate and expensive clothes. However, some do note that there were no clear instructions how to assemble and use it. With a load capacity of 5 lbs, a size of 16.2 x 13.1 x 12.8 inches, this hand-powered clothes washing machine weighs only 6.4 lbs and can be comfortably carried around. Overall, it is a low-cost product that requires hand cranking to work, so if you are looking for something cheap, you might want to consider it. One user shared that she washed her clothes quickly and it works perfectly with only one tablespoon of liquid detergent. For her, this is one of the most economical washers that she had encountered. A pleased customer comments that it’s very easy to drain the washing machine by just tipping it down the sink or using the drain spout. Another buyer states that she washes a load in the compact washing machine for about 3 minutes, even if the clothes are stained and dirty. However, she warned that this portable washing machine requires arm strength, but it’s perfect for camping and RVing. Some users complain that it’s too messy and time-consuming to use this compact clothes washer and they would achieve better results hand washing. Also, there are complaints that it arrived broken or started leaking after use. If you don’t want to use a laundry mat and you are looking for a high-quality washer, you might want to consider this Haier portable washing machine. Users love that it’s convenient, easy to use and that it’s perfect for larger washing loads. However, some do note that it’s too loud during the spin cycle. Made from stainless steel, this portable clothes washing machine has a 6-pound capacity, 3 water levels, 3 washing cycles, LED indicator controls, wheels for easy rolling around, and a sink adapter. It weighs 43 pounds, and it seems well-made, but a high-cost product. Generally, users are pleased with the performance, durability, and effectiveness of the Haier small portable washer. 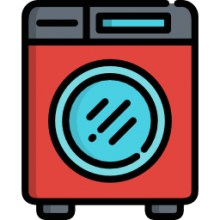 One user shares that it’s easy to hook up and use it, and she would recommend it to anyone looking for a high-quality washing machine. A pleased buyer stated that she finished her laundry in about 20 minutes and the clothes came out almost dry. She shares that it was also perfect for delicate items, but the noise could be a problem if you have neighbors. Another customer says that the drain hose and the water hose are long enough to reach the sink, and she has no leaking problems at all. However, some customers have complained that they do have leaking problems and that the spinning cycle stopped working after a few months. One of the more highly rated portable washing machines that we reviewed was the Giantex compact twin tub washing machine with spin dryer. Buyers say that it has the capacity for a single person, or perhaps for a married couple- saying that it is an amazing alternative to manual hand-washing of clothes, especially if your apartment or house just doesn't have the capacity for permanent installation of a washing machine and dryer. One reviewer describes doing a ton of by-hand clothes washing and lugging clothes to the local laundromat- a real annoyance for her. She ended up purchasing this Giantex portable washing machine, saying that its capacity is a lot larger than what she expected. In the early days, she spent a lot of time experimenting with just how many shirts, pants, underwear and sweatshirts she could load into this unit without over taxing it. She discovered that since jeans get saturated and heavy inside the washing machine, it's best to wash them separately as a very light load. She also says that while the spin dryer is effective, it is smaller than the washing machine capacity itself, so you'll have to split one load of laundry into two in order to spin dry effectively. She, as well as a lot of other reviewers, were incredibly surprised at how dry the clothes emerged from the spin dryer. She was incredibly thankful that she doesn't have to perform any more manual hand-washing and tedious hand-wringing of clothes. Another apartment dweller concurs with this reviewer saying that this portable washing machine is an excellent alternative to the filthy machines in service in their condominium basement, and a cheaper alternative to going to the local laundromat that was over a half mile away. This reviewer also had to conduct some initial trial and error loads of wash before they figured out the best way to use their portable washing machine. Initially they had over-filled the machine with water which caused it to leak out of the top while working they also complained that the instructions were a bit too remedial, and consequently unhelpful. Apparently, it is a bit of an art form to get it working right, but eventually users discovered the right amount of load and water to use with the washing machine in order to get the best results. Also because this is a manual draining washing machine, you should get used to dumping out buckets of water down your bathtub or sink drain. Another option that we examined was the Panda compact washing machine, which comes in two different sizes one that is 7.9 pounds capacity and I'm a larger one that has 15 pounds capacity. As before, many purchasers are apartment dwellers that are disgusted by their apartment basement washing machines, and figured out that buying their own would be a more sanitary cost-effective option of laundering their families clothes. One reviewer is particularly pleased with the included spin dryer and the healthy laundry capacity, which enables her to do pretty large loads all at one time, all with the assistance of an electrical pump that makes the draining and rinsing process much easier to do. This particular reviewer also had some handy advice since she is a heavy user of this washing machine. She advises that when you're not using the Panda washer that you should leave the doors to the spin dryer and washer itself open so that all of the water dries out. This effectively reduces the chances of developing mildew and mold associated with moisture. Another tip that she had was that the first time you try washing some clothes in it, experiment using no soap, only water, setting the timer for five minutes. She says that because a lot of soap residue gets caught in clothing fabrics and fibers, you'll discover that with a little bit of washing machine agitation, along with some clean water, all of these suds and foams will appear out of your clothes. Another reviewer provided some pithy feedback saying that on the positive side, it is a unit with a really small physical footprint, light enough that it is feasibly portable when not loaded up with laundry, and produces pretty surprising positive effects for dirty clothes. On the downside she and other reviewers say that the lint trap is not too effective- so if you are trying to launder some clothes with a great amount of lint, you may end up having to remove the lint manually. This user also has some interesting advice- she said that you should test how long it takes to fill up the unit with both hot and cold water flows, that way you can just time it going forward, instead of standing there and watching as the unit fills up with water. As well, she cautions that some items become particularly heavy when wet, like denim, so you should be extra careful loading up your machine with this type of fabric because if the unit is overweighted, the clothes won't spin as effectively, therefore not getting as clean. Initially, you can experiment with adding clothes items one at a time and ensuring as you do that the agitator is spinning effectively- this will give you some solid feedback concerning the capacity of your portable washing machine. If you're in the market for a portable washing machine, perhaps to install on a temporary basis in your apartment, or even for long-term use, make sure that you understand that there is some initial trial and error involved in getting the washing machine up and running. You'll have to be comfortable experimenting for the first week or two weeks before you discover the best way to use it. 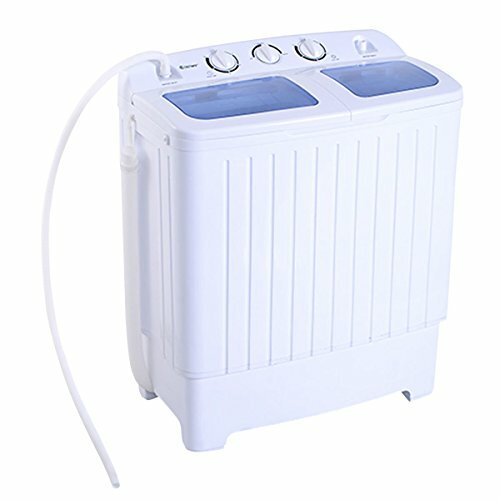 Whether you end up installing it in your bathroom for easy drainage, discover the best flow rate to measure out how long it takes to fill up with water, or analyze the exact amount of clothes you can add before you overtax the agitator, these are all trial and error considerations that you will have to undergo using one of these portable washing machines for the first time.